March 6, 2012 By This post may contain affiliate links. 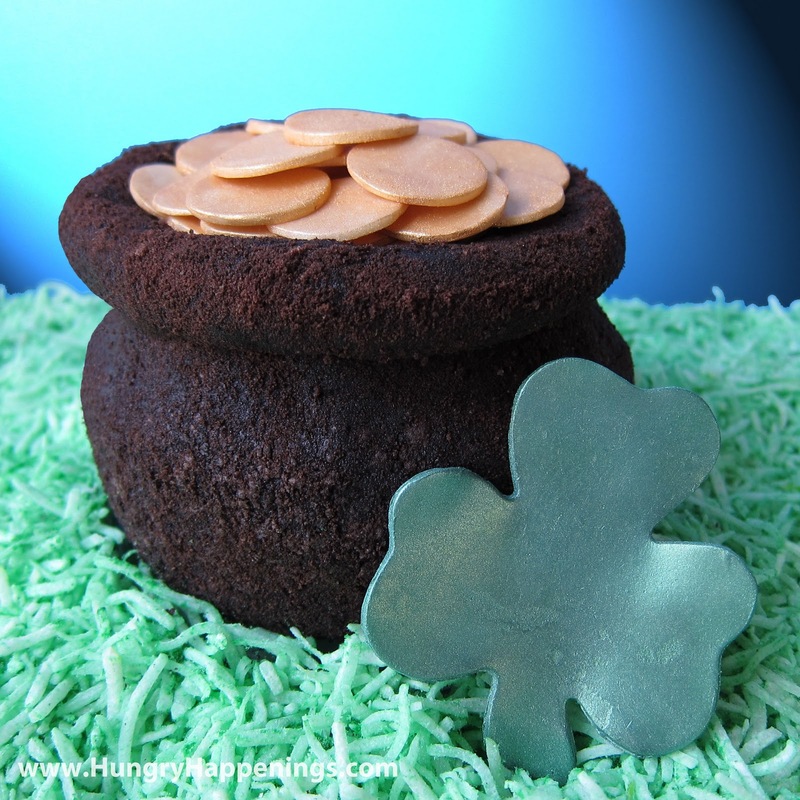 Get festive and make one or more of these delicious Recipes To Celebrate St. Patrick’s Day! 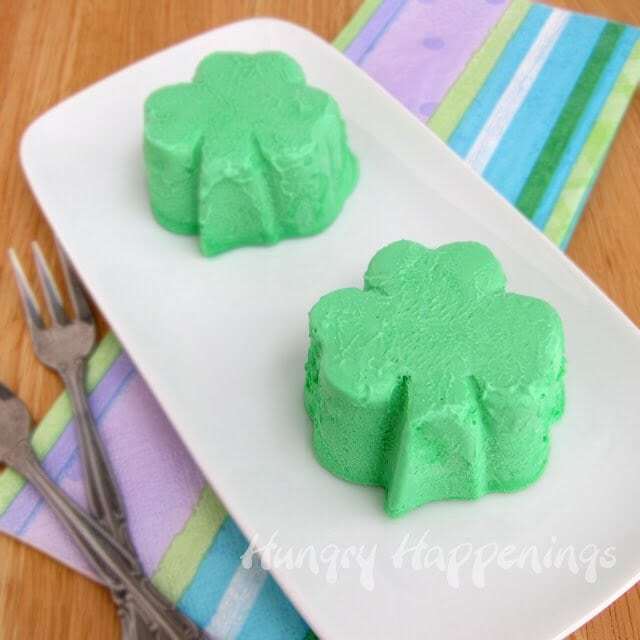 Along with those delicious recipes try making a Shamrock Semifreddo! This cold treat will melt in your mouth and have your taste buds in heaven. A few years ago I made my first semifreddo, a semi-frozen mousse like dessert, and fell in love with it. Since then, I have had fun experimenting with all sorts of flavors and my husband’s favorite was lemon. I found a recipe that basically had me making homemade lemon curd from freshly squeezed lemons into which I folded whipped cream. Once frozen, I served it with a homemade blueberry sauce. It was really delightful. A few months later, my friend asked me to bring the lemon semifreddo to a luncheon, but I was really strapped for time, so I cheated and bought a jar of lemon curd to use instead of making it from scratch. I worried it wouldn’t taste as good, but to my surprise it was almost identical and all of my friends raved about it. Since then, I have made this super simple semifreddo recipe using not only lemon curd, but also, lime curd, key lime curd, coconut curd, caramelized banana pie filling and key lime pie filling. I often just mold my semifreddo in a loaf pan, freeze, slice, and serve. For holidays however, I like to use festively shaped silicone molds instead. 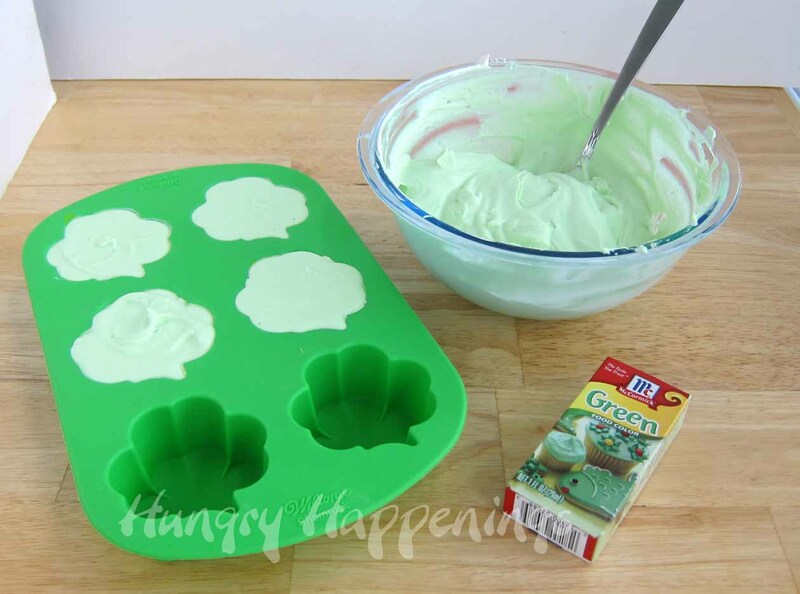 For St. Patrick’s Day I decided to use Wilton’s Silicone Shamrock mold to make green shamrocks out of lime semifreddo. I used Dickinson’s Lime Curd as that is readily available at my grocery store for about $4.00 per jar and was happy with the flavor for this recipe. You can use key lime curd or even a jar of key lime pie filling instead. If you like a stronger lime flavor, you can even add a bit of lime or key lime zest to the recipe.Before I get to this new recipe, I thought I’d share a recap of last years St. Patrick’s Day ideas. 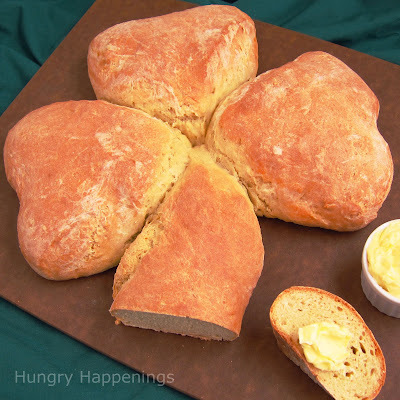 Recap of last years St. Patrick’s Day recipes from Hungry Happenings. Wouldn’t you love to find this Sweet Pot of Gold at the end of a rainbow? white modeling chocolate gold coins. 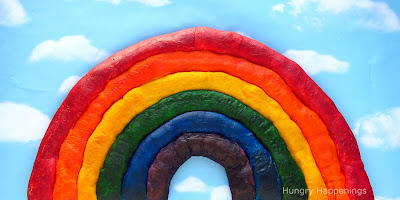 this Rainbow of Hot Dogs in Crescent Rolls would be perfect. a few minutes to mix and knead 4 ingredients together. for a great addition to your dinner on March 17th. 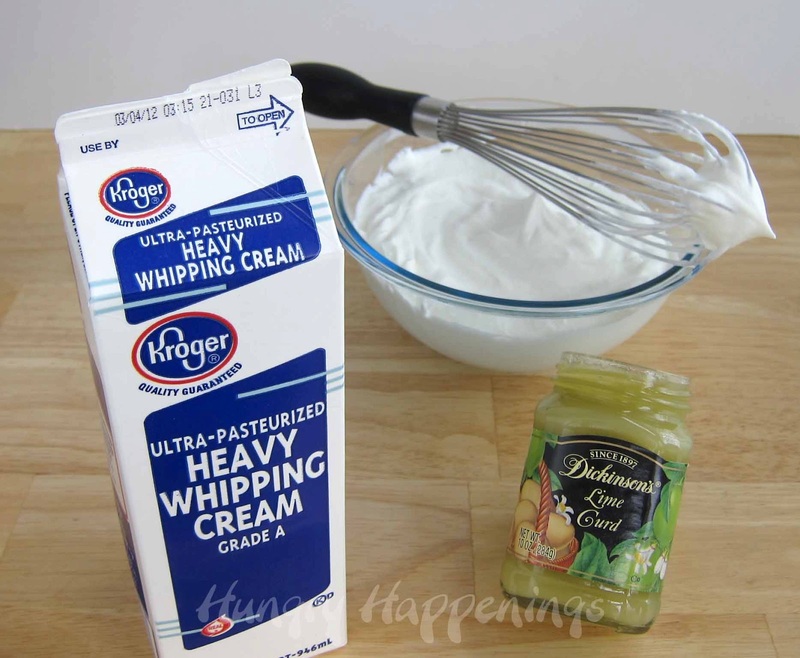 Whisk whipping cream to stiff peaks. Add key lime curd and 20 drops of green food coloring and whisk just to combine. Add more food coloring until you reach the desired shade of green. 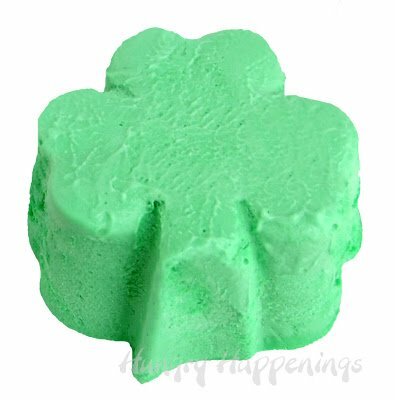 Spoon mixture into the cavities of the shamrock molds. Freeze for at least 8 hours. Remove from freezer. Fill the bottom of your sink with 1/2″ of hot water. Set the mold, silicone side down (semifreddo side up) into the water for 5 seconds. Dry bottom of mold, invert mold, press on the shamrocks to release the semifreddo from the cavity. The tops of your semifreddo shamrocks will be bumpy. You can use a knife or spatula to smooth them, if you’d like. Serve or store in an airtight container in the freezer for up to a few weeks. Items used to create this recipe available on Amazon.com. Wonderful ideas, thanks! Delicious, beautiful and interesting! I've never heard of lime/lemon curd before….is that price correct under your post on Amazon? $43.34 for a 10 oz jar? Surely it isn't that much! Is it? HI Angela, that price is for 6 jars and it is high per jar. I couldn't find a link for just one jar, and just wanted people to be able to see the product. I purchased my jar for about $4.00 at Kroger but have also seen it at Cub Foods and other grocers. That looks so great. I love the pictures. Come visit us. We have some wonderful things to share this week. that sounds so good, I love that you can change up the flavors. The coconut curd in a jar is not easy to find in most grocery stores but it is made by Dickenson's too. I found it at Jungle Jim's in Cincinnati, Ohio, but I bet it's available on-line. It is very tasty. When My Kids were little I would make green oatmeal for breakfast. Even now we still have the traditional corned beef and cabbage for dinner. Those Shamrock Semifreddo's look yummy! Sei un mito! Mi hai dato tante idee per le feste del mio bambino! You're a legend! You gave me lots of ideas for the birthday of my baby! This looks delicious and so refreshing! I love all the other ideas too! I'm going to post this on my FB page! Thanks for linking up to my party! What a wonderful idea for St. Pat's Day festivities, thanks so much for the post! They look so cute! These ideas are all so great!! Love the irish bread 🙂 Thanks so much for sharing with us at Sharing Saturday. hope to see you again this week. Hi! Your semifreddo recipe was nominated as one of the "Best 300 Semifreddo Recipes on the Net". To vote for it, please visit http://easyitalianrecipes.org/dessert-recipes/best-300-italian-semifreddo-recipes-on-the-net-vote-for-your-favorite/ – your recipe is positioned at #190 (random order).